Doctor Who: And The New Companion Is... | Warped Factor - Words in the Key of Geek. They think the wait is over. It is now. Those of you who tuned into this afternoon's FA Cup semi-final would've caught a specially shot two minute Doctor Who minisode, titled Friend From The Future, introducing the new companion joining Peter Capaldi for series ten of Doctor Who. 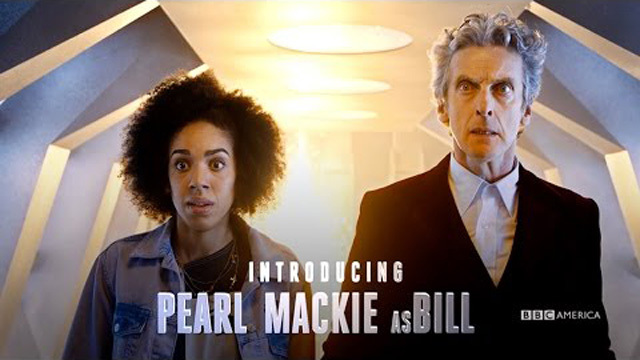 The character's name is Bill, and she will be played by Pearl Mackie. On joining the cast in her first major television role, Pearl said: “I'm incredibly excited to be joining the Doctor Who family. It's such an extraordinary British institution, I couldn't be prouder to call the TARDIS my home! Brian Minchin, Executive Producer adds: "We're utterly thrilled to have the hugely talented Pearl join Doctor Who and I can't wait to begin her new adventures in time and space!" After airing exclusively on BBC One, the Doctor Who trailer can now be seen on BBC iPlayer, and on BBC One and Doctor Who social media platforms. Doctor Who is a BBC Cymru Wales produced drama and will return later this year with a Christmas Special. The new series will start on BBC One in 2017. Good choice? Bad choice? What do you think?